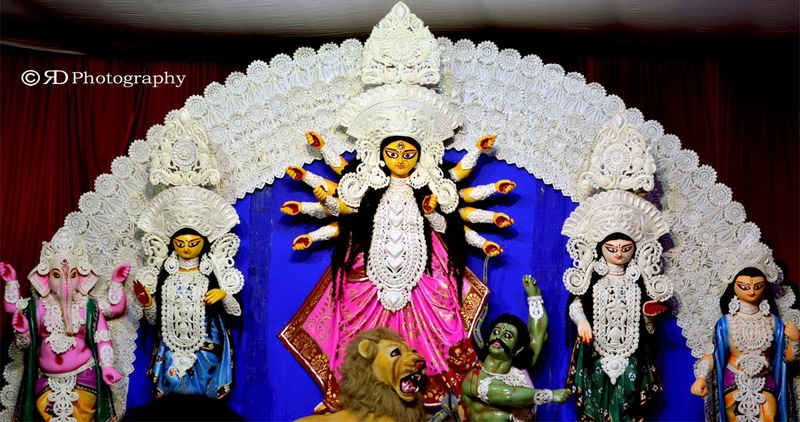 Subho Bijoya and Happy Dussehra to all my fellow readers. It was a busy and bright week for us due to our grand festival Durga Puja. 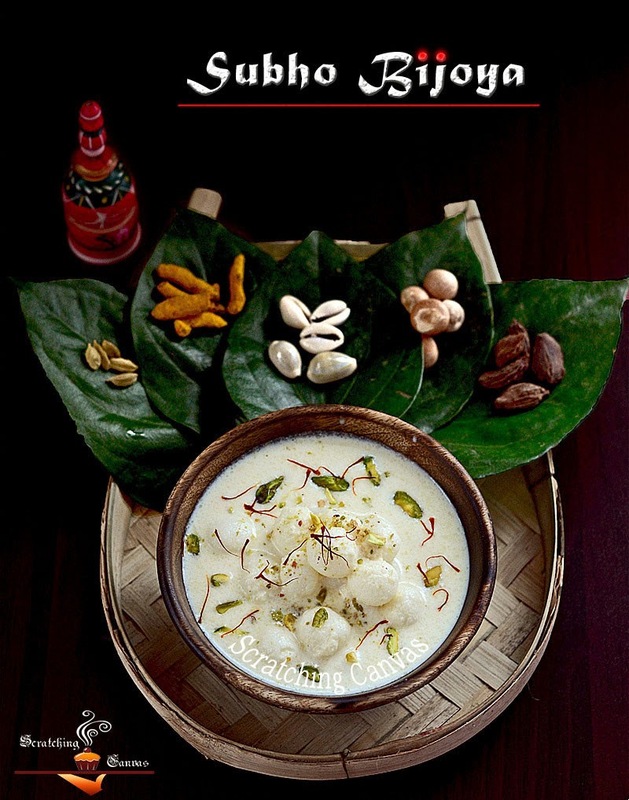 We Bengalis wait for this festival throughout the year and enjoy these days most. But now it’s all silent and sad; more like a thin air of melancholy has surrounded us. All 5 day’s happiness cheerful moments are gone now and there will be a long wait for another 365 days. I know these days I kept telling you how much I miss Durga Puja and the festive beat which may seem to be annoying to some people. If you are staying far away from home for a long time like me you will be able to feel my pain. I just can’t stop myself from being nostalgic; simply helpless (read, hopeless). Those late night roaming around the city, huge crowd, lighting on the streets, sky touching (feels so from the ground) statues around/inside pandals, innovative pandals, evergreen idols, enormous street food. The list will go on and on. I miss my city like I never miss anything in my life. 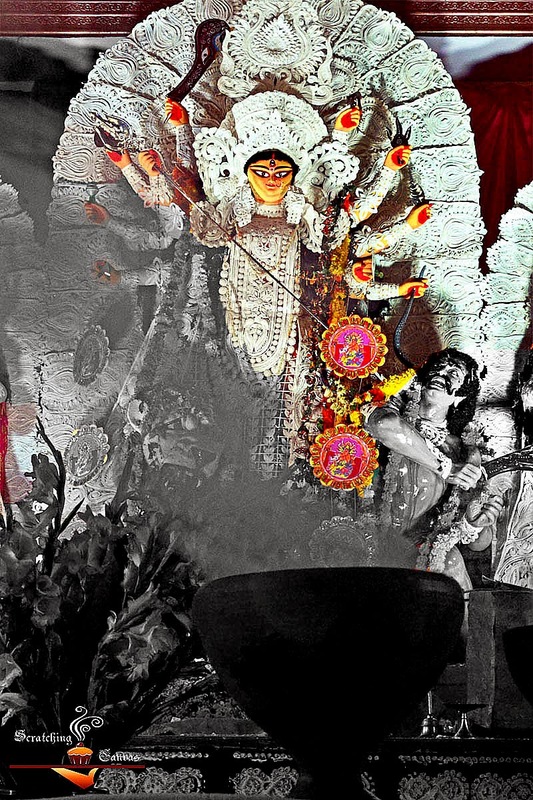 Every year I think I’ll make up my route to my city during next year’s durga puja. Alas, that day is yet to come in my life. Thankfully I have handful pujas in my current city. They are not as big as my hometown; neither as happening nor as luxurious. But they have their own charm, a different touch which I have started to like. They have a simple homely touch which can’t be avoided any how. In previous years’ also I visited those puja pandals and had my fun. This year I had planned to have my pandal hopping here also so I arranged everything accordingly and now I can say I had my best puja here this year. They say, ‘All’s well that ends well’ and it’s my belief too. I already had a ‘gala’ puja week so why not celebrate the Bijoya in a grand way. I had always seen my mom to serve few sweets and snacks after Bijoya. I just tried to replicate the same in my home for last few years. This year I was so impressed by local festive mood I decided to recreate something from local sweet shop and I chose Angoori Rabri for my Bijoya Dashami celebration. 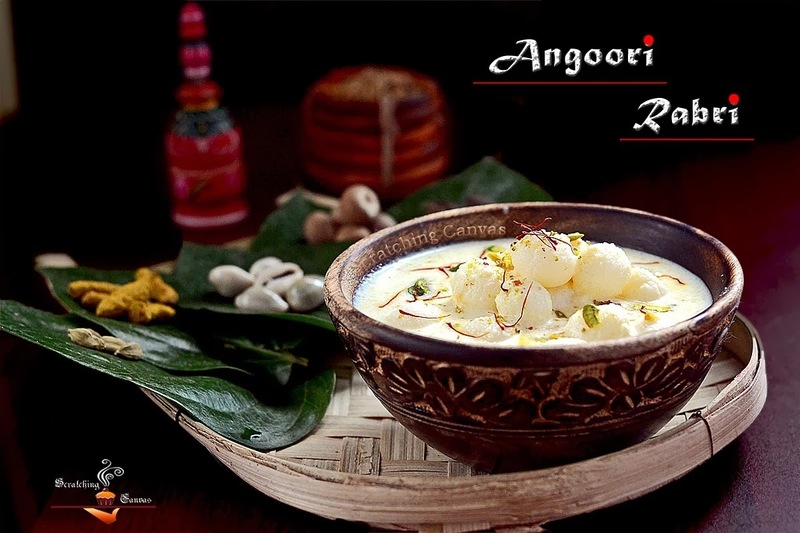 Angoori Rabri is extremely delicious & rich milk based dessert. It is originated from Punjabi cuisine and very popular in north India but due to the modern mix-n-match it is getting popular in all over India. 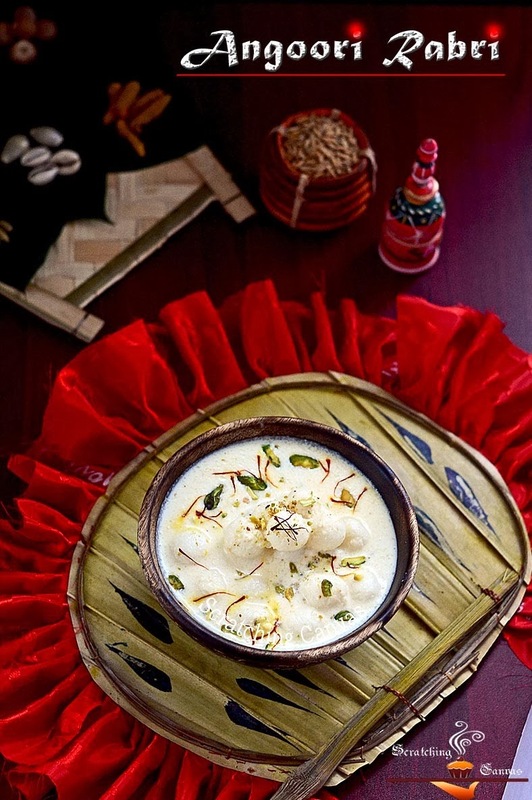 Angoori Rabriis very much similar to Bengal’s Rasmalai. In fact the basic concept is same for both desserts. 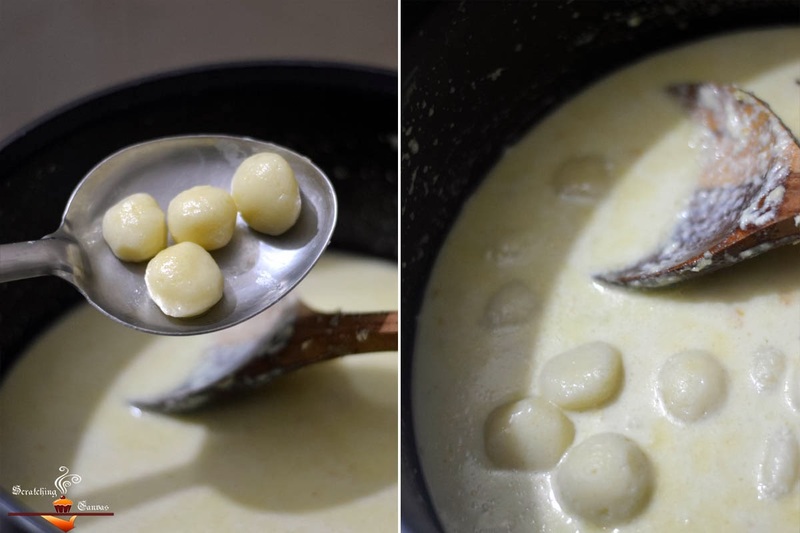 In Angoori Rabri precooked small cheese balls, more like ‘angoor’ or grapes (that’s why it is named as ‘Angoori’) are cooked in Rabri. 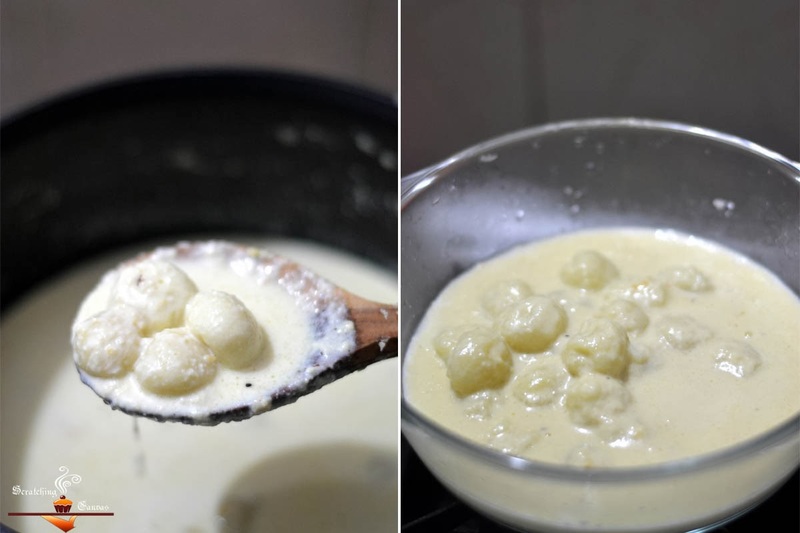 In Rasmalai precooked cheese balls are more like Rasgullas and cooked in milk. Here is my authentic Angoori Rabri recipe for you all. Take a pressure cooker. Add water for syrup and bring it to boil without the lid. Once the water starts boiling add sugar and stir continuously. 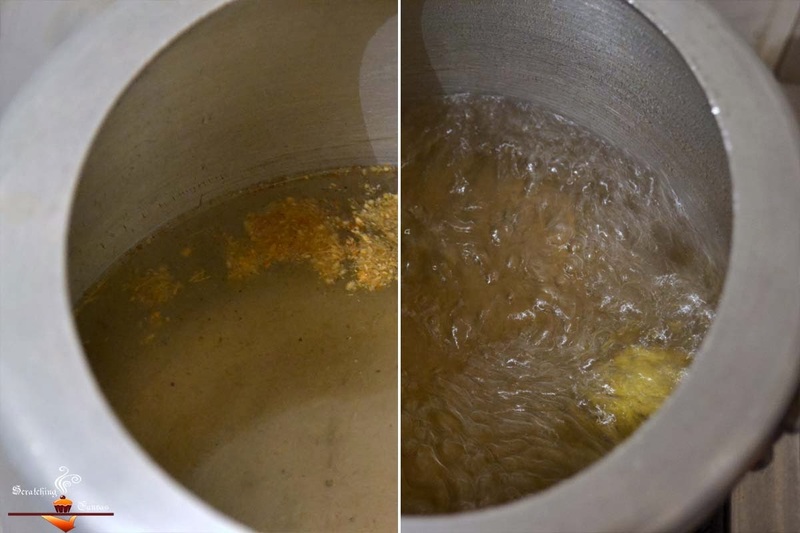 Once sugar is dissolved add chenna balls gently in the pressure cooker one by one. Don’t add many together otherwise they will break into pieces. Be careful at this step as chenna balls are too tender to handle now. Cover the lid with weight and wait till 1 whistle. Take out the steam forcefully and let it boil on high flame without the lid for next 10 mins. Now poke one mini rasgulla with the back of a spoon. 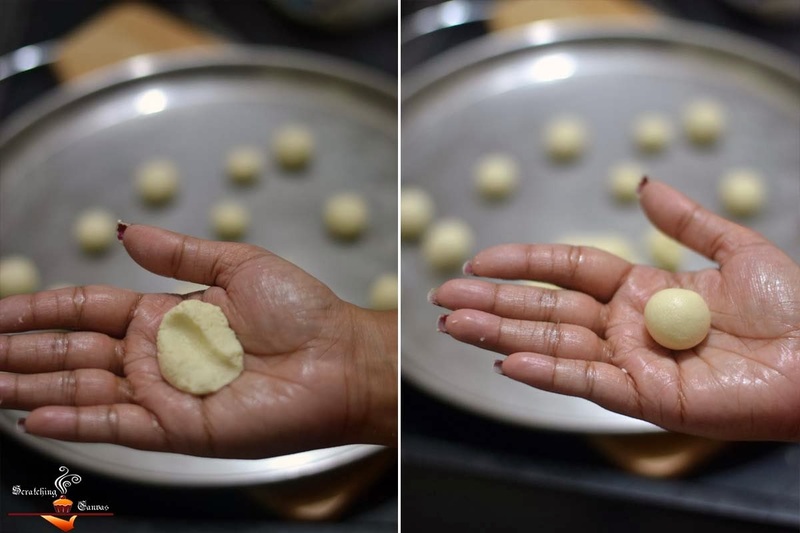 If it gets back the shape, rasgulla is done; and if not cook for another 5-8 mins. Transfer into the separate bowl and discard the syrup. Allow it to cool a bit. In the mean while prepare the Rabri. Take a large nonstick pan and bring the milk to boil. 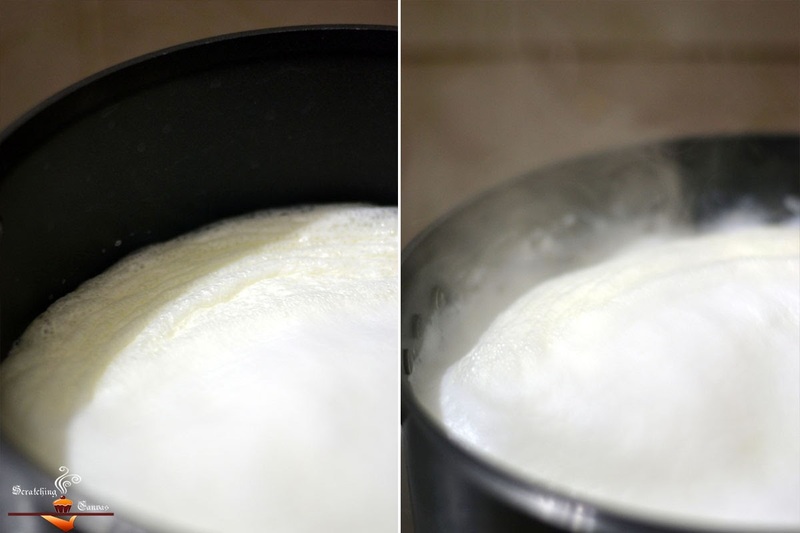 Turn down the flame and keep on simmering until volume of the milk is reduced to 1/3rd of its original volume. Keep stirring the milk in between to avoid burning at bottom. It will take approximately 20-30 mins. Mix the khoya/mawa into the milk and stir continuously until blends well. 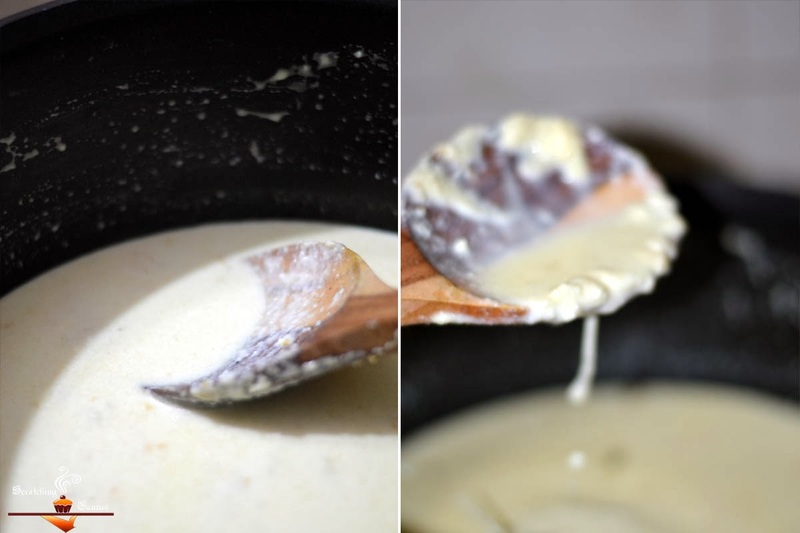 Add condensed milk and mix well to blend smoothly. It’s now time to bring out our previously made mini rasgullas in front foot. 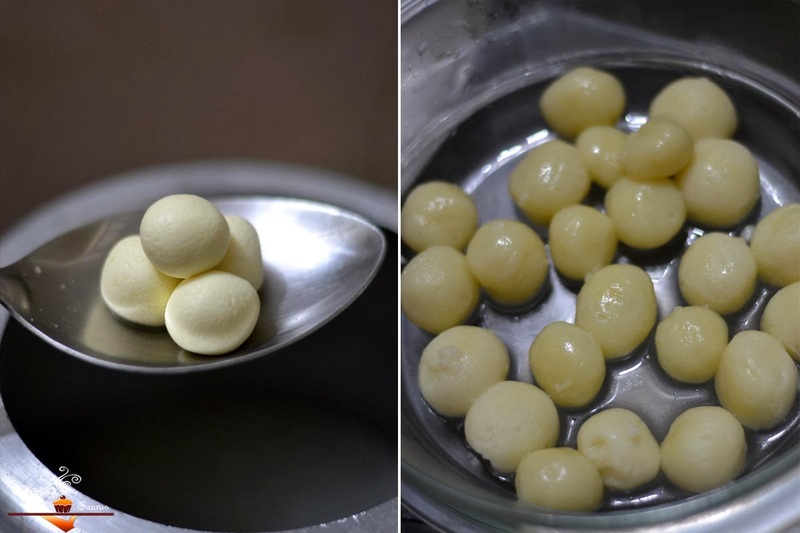 Squeeze the mini rasgullas and get rid of sugar syrup in it. Drop them in simmering milk and simmer for approximately 8-10 mins. Switch off the flame and transfer to the serving bowls immediately. Now allow your Angoori Rabri to cool and let it come to room temperature. Refrigerate for 1 hr. but remove from refrigerator 10 mins before serving. Garnish with pistachio slivers and saffron strands and serve! 1. 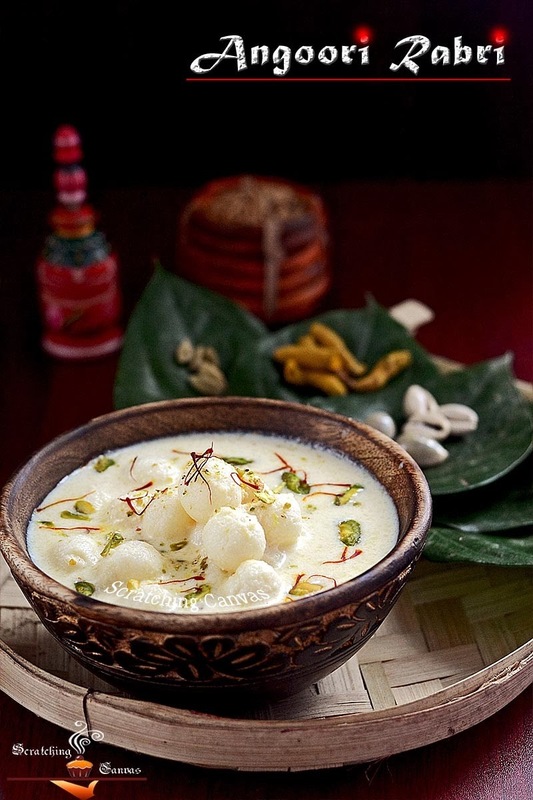 If you are making Rasgulla, Rasmalai, Komolabhog, Rajbhog or anything which follow the basic process of making rasgulla always consider fat free milk. Never opt for full fat milk. 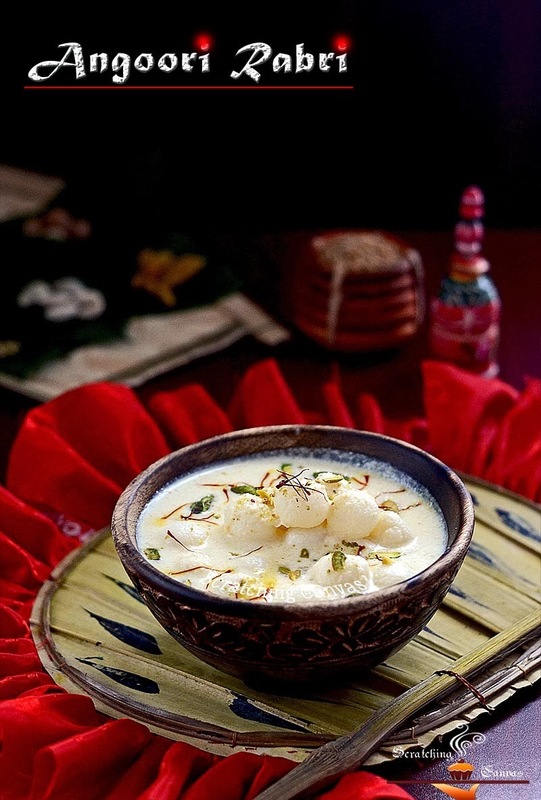 It is a misconception that more fat you will add, better your rasgulla will be. The fact is if you use the fat in the process, your rasgulla will be solid and heavy. And when it will be added to the sugar syrup it won’t be puffy and juice. Lesser the fat you will use from your milk spongier your rasgullas will be. 2. Semolina gives a similar texture of Khoya. 3. 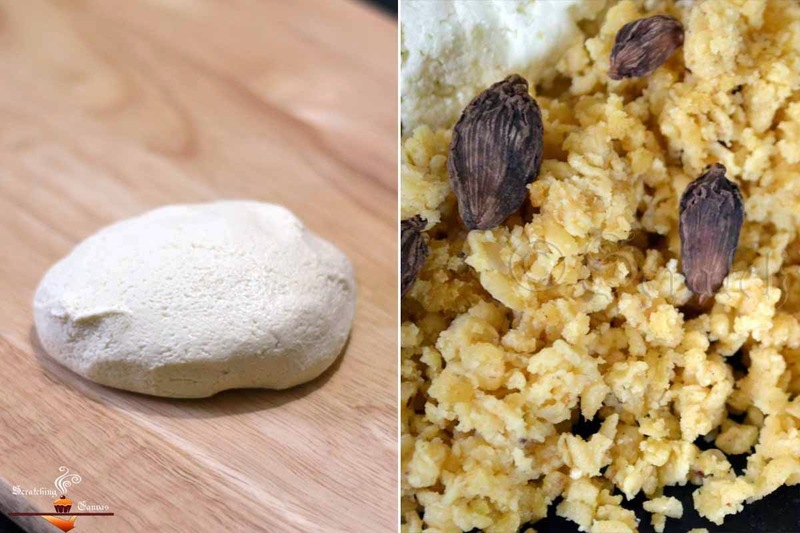 Non glossy wooden surface is the best known medium to knead the dough for rasgulla. 4. If you find your dough too sticky to handle add 1-2 tsp of flour to it. It will absorb the excess moisture from the dough and this will also help to give it a shape later. Don’t use more than 2 tsp of it. As it will definitely give your rasgullas perfect round shape but they will become rock hard.